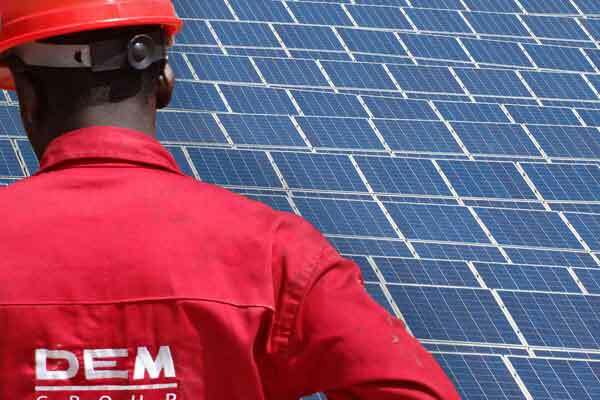 DEM Group continues its expansion and aims at widening its value proposition by signing a strategic partnership agreement with Enerdeal, a specialist in industrial-scale solar power plants. The collaboration between these two key players brings a reliable and sustainable energy solution in Africa. A state-of-the-art solution for Africa: the hybridization of photovoltaic solar energy with diesel generators, possibly combined with battery storage, can bring a significant reduction of fuel consumption by 20 to as much as 40%. It also reduces logistical constraints (diesel supply) and environmental impact (pollution related to CO2 emission and fuel leak) as well as price fluctuations (exchange rates, oil price volatility, … ).